Over the years, I’ve experimented with several ways to give me space to reflect on my work as a manager. The goal has been to create a cadence for developing self-awareness of my leadership patterns and performance. Today, this primarily takes the form of a Clarity Break, but every so often, I return to an old journaling exercise. On a daily or weekly basis, take 15 minutes to reflect on three areas: The IT, your tasks and your work; the WE, your relationships and the quality of your interactions; and the I, your attitudes and energy that you bring to the workplace. After reflecting on each area, you explicitly state your intentions about what will you do in the days and weeks to come. Here’s a set of prompts to help you work through each. 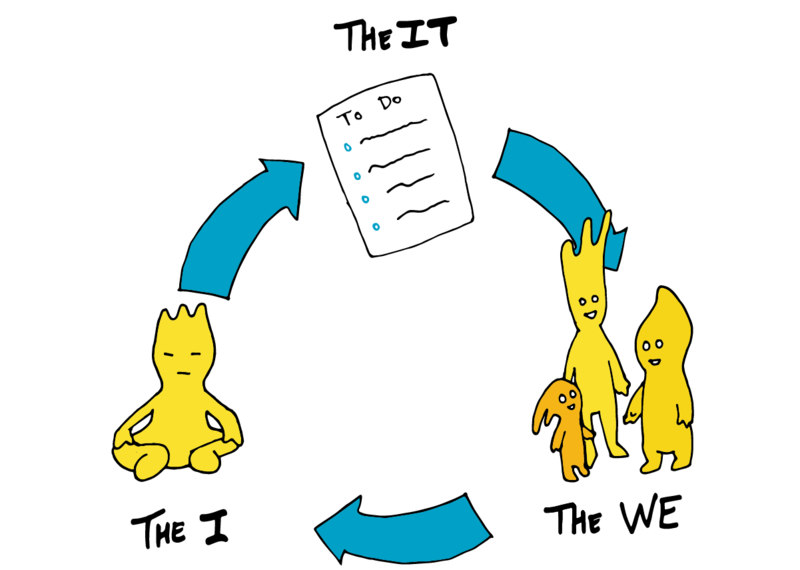 The IT encompasses your tasks and all the external stuff of your role at work, such as your goals, your progress against the goals, and the myriad items you’re getting done at any given time. Did you execute your work — the stuff you had on your to-do list at the start of the day? Did you do things that were important and not just urgent? Create a to-do of the items you intend to accomplish. For your upcoming meetings, identify the purpose and goal. What do you need to accomplish? Does the agenda support this outcome? The WE highlights your relationships and the quality of your interactions, whether with members of your team, with customers, or other key stakeholders. Did I add value to the lives of people I interacted with? Did they walk away with more knowledge, energy, goodwill, and a better understanding? Do I anticipate a challenging interaction? What will trigger a poor response? How can I rehearse how to respond? The I captures how you are managing yourself. You’ll reflect on the attitudes and energy you bring to the table. How did I manage my own energy and mood? Did I eat well, exercise, and get enough sleep? How can I set myself up to make good choices throughout the day? What might cause me to step off track? What is the right course of action? When I did this exercise on a daily basis, it took as little as 5 minutes. The frequency helped me quickly identify triggers and inputs that would lead to happy, productive days, as well as areas I needed to improve as a leader.